The shape of the silver star in the Kwan Gi represents the eight directions of the compass. The words Chil Sung translate to "Seven Star" and refer to the seven stars of Ursa Major (the big dipper). This constellation is used to find Polaris, the North Star, in the constellation Ursa Minor (the little dipper). The star is used as a symbolic beacon for navigation in your training and in life. The Chil Sung Hyung is a series of seven forms, created by Hwang Kee and introduced in 1952, designed to be an individuals path toward balancing Weh Gung (external energy) and Neh Gung (internal energy). This balancing concept is known as Chun Gul Ryu, which translates into Middle School. 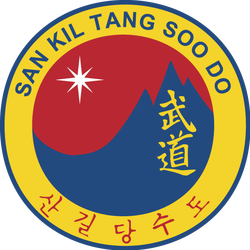 Used in our logo it also represents Kwan Jang Nim Hwang Kee's unique influence upon the development of Tang Soo Do. Other sources can be cited that claim that Chil Sung is a term already richly engrained in Korean culture. Chil Sung is claimed to be a composite of Tae Guk (Um/Yang) plus O Haeng (5 Elements) . The Um/Yang is the red and blue symbol found on the Korean flag. The 5 elements in Chinese philosophy are Earth, Water, Fire, Wood & Metal. At one time the combination of these seven components would've represented all things in nature and thus been the basis for understanding the world.